We’ve re-arranged the review section and added additional details in regards to the size and durability of each of the golf mats reviewed. The Winner The Dura-Pro Plus Premium Golf Mat offers an absolute pinnacle of quality on just every important aspect of a golf mat. Excellent 100% knitted nylon surface quality, offering one of the most realistic emulations of the fairway green. Thermally welded to prevent delamination, excellent durability, and excellent overall quality. It is the best golf mat for most golfers. The Dura-Pro Plus Premium Golf Mat is an absolute beast in quality. It is 4’ x 5’ in size, similar to the Emerald Par Golf Mat that we also reviewed below. Yet, the Dura-Pro Plus Premium offers the best quality in just about every aspect. The surface turf is made out of 100% knitted nylon, which is more durable and offers a more realistic emulation of the fairway green. The layers of the Dura-Pro Plus Premium are thermally welded rather than glued, preventing delamination. 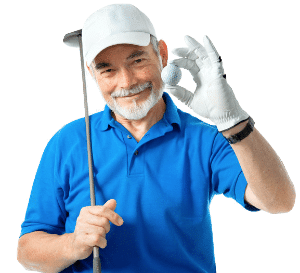 The package also includes a golf ball tray that can hold a couple of dozens of balls or so, and a rubber tee holder where you can use your regular wooden tees. An excellent long-term investment. Next, we reviewed the Rukket Tri-Turf. There are two key highlights for this product: first is the three different surfaces available, emulating the fairway, the rough, and the tight lie. Second is that all three surfaces are packed in a very portable with 23.5” x 36” or 25” x 16” size options. The three different ‘turfs’ are distinct enough from each other, and all three are built with exceptional quality. Due to its portable size, the Rukket Tri-Turf is also fairly light with just slightly over 11 lbs, and so is easy to move around for storage. An excellent pick if you are looking for an affordable golf mat with three different surfaces to practice on. With the XL Super Tee Golf Mat, the key highlight here is the 3’ x 5’ size, which is arguably, the ideal size of golf mats for most uses. It is reasonably priced and features a 100% nylon surface with 1.25” of thickness. The result of this combination is a very durable golf mat with an almost natural emulation of the fairway green. The nylon surface slows down your clubhead speed properly during an impact, a common issue with most golf mats. As a result, you will have almost similar practice results on the XL Super Tee Golf Mat and the real course. Finally, we tried out the Emerald Par Golf Mat. It is slightly bigger than the XL Super Tee, yet is also slightly more affordable. So, it begs the question of whether the Emerald Par compromises its quality. Thankfully, that’s not the case, as the Emerald Par is also built with a 100% Nylon material that is ½” thick. To support the nylon surface, there’s also a 5mm foam base to ensure stability and durability. A minor downside of the Emerald Par is that you can’t use golf tees of differing heights, and can only stick to the built-in rubber tee of ½ “. 6.1 What are the different types of golf mats available? 6.2 What are the key characteristics I should look at before buying a golf mat? 6.3 What are the different price points for a golf mat and which one do you recommend for beginners, mid-level and advanced players? 6.4 What size should I pick for my golf mat? 6.5 What material should my golf mat be made out of to not damage my clubs? 6.6 Are golf mat tees different from regular golf tees? 6.7 How can I make sure to practice properly with my new golf mat? There are two main highlights of the Rukket Tri-Turf. 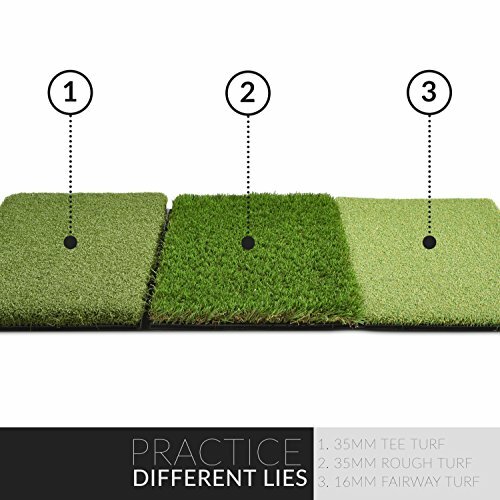 First is obviously the three different surfaces included with the golf mat: one emulating the fairway, one emulating the fringe, and one emulating the rough lie. The second key feature is portability. There are two different sizes available with the Mat-Attack Tri-Turf: 23.5” x 36 “ (XL) and 25” x 16”, and even the XL version is very portable. So, if you are looking for a portable golf mat that is easy to set up and store, the Rukket Tri-Turf is an excellent choice. Speaking about ease of installation, it has a lot to do with the weight of the Rukket Tri-Turf. It is only 11.4 lbs in weight, and so it is relatively easy to move around. There are 12 different plastic tees included in the package with different heights, and they are also very easy to set up on the golf mat. Since the Rukket Tri-Turf is relatively small with three different turfs, obviously the main concern we’ll have is whether each turf will be too small for practical purposes. 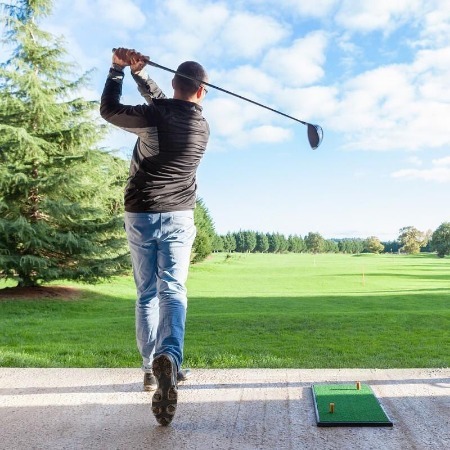 Thankfully, that concern has been proven wrong, as each third of the golf mat is actually large enough for a comfortable swing. The Rukket Tri-Turf also features a 2mm rubber as the base, which ensures the stability during use. During our tests, the Rukket Tri-Turf moves very little with each swing, although it moves a little bit more when you are using the short irons. Regarding durability, the Rukket Tri-Turf is also surprisingly durable and well-built. It is advertised to last 1000s of swings, and that seems to be true. After our tests with probably several hundreds of swings, the mat doesn’t show any signs of tearing or wearing. There are only a couple of minor downsides with the Rukket Tri-Turf golf mat. First, the portable size is not for everyone. 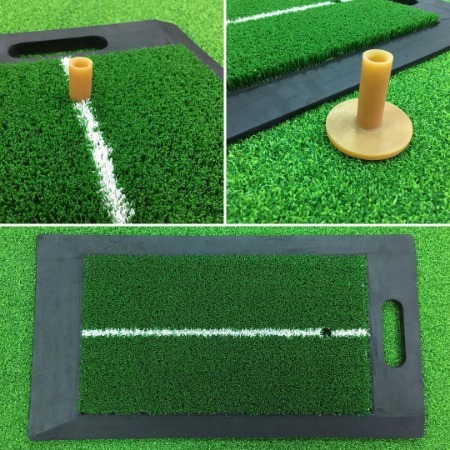 Some might prefer getting an individual golf mat for each ‘terrain’ to get the most of their practice sessions, and even though it’s not a major issue, you might need another rubber mat to stand on to stay level with the portable surface. Second, although it is fairly durable, there are definitely more expensive golf mats with better durability and overall quality. Speaking of expensive, the affordability of the Rukket Tri-Turf is also one of its best qualities. It is quite affordable for all the features it offers, making it an excellent choice especially if you need to practice on all three different turfs. Key Features Three Different Turfs: The Rukket Tri Turf features three different tufts: the first emulating the ‘standard’ fairway turf, another one emulating rough turf, and the last one emulating the tight lie. The three turfs are distinct enough to provide different training conditions, and are realistic enough to emulate the natural turfs. 2mm Rubber Base: The relatively thick rubber base allows both stability and durability. The Rukket Tri Turf is quite stable, and won’t move around much after each shot. The rubber base also protects the top turfs from significant damages after impact. High-Quality Synthetic Grass: The fringe/tight turf of the Rukket Tri Turf is 16mm thick, which is smooth enough to emulate the short game feel. Both the fairway and rough turfs are 35mm thick that are not only durable, but offer realistic approach shot feel. All three turfs are separated by dual separations. 12 Included Tees: One of the major weaknesses of practicing on golf mats is the tee. Most golf mats feature a fixed tee that can’t be adjusted, or you’ll need to purchase a rubber golf tee separately. With the Rukket Mat-Attack Tri-Turf, the package included 12 different plastic tees with differing heights. Each tee easily goes into the mat just like when you use a regular tee on a course. 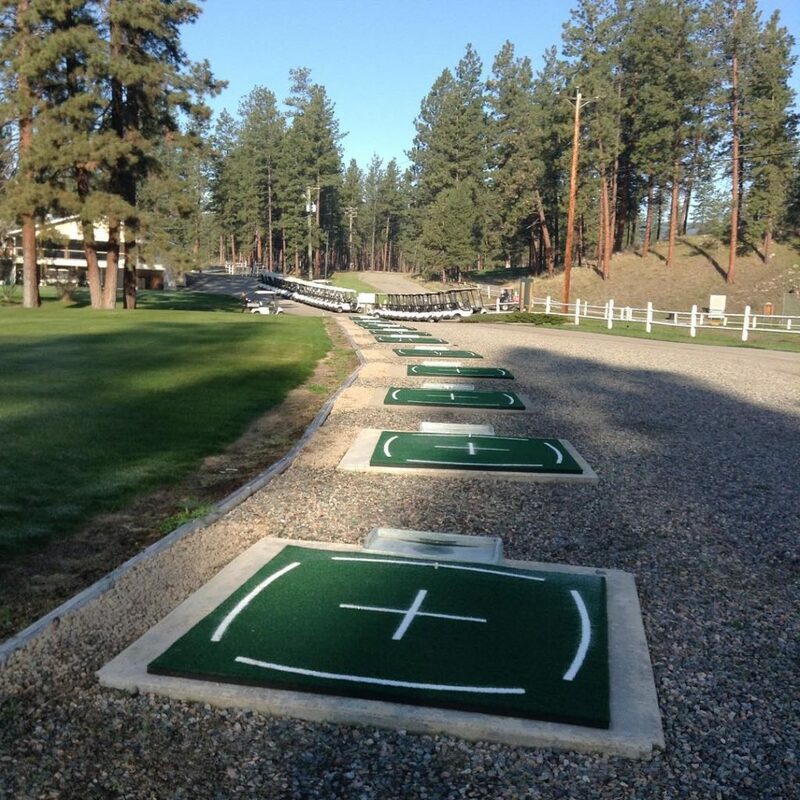 The XL Super Tee Golf Mat is, in many ways, a very basic driving range mat with basic features. First is the size. The 3’ x 5’ dimensions, or 36” x 60”, is the perfect size for most training applications. It is large enough to allow us standing on it comfortably, so you won’t have the height difference issue that is common with more portable golf mats. The size is also still relatively compact, and with only 14.9 pounds of weight, the XL Super Tee Golf Mat is easy to move around and store, if that’s your preference. Next is the superb quality of the surface. The surface is 100% nylon which is the most durable material you can expect on a golf mat. Not only the nylon surface is strong and durable, but it is also well-made to provide you with a very realistic surface. Meaning, when you are playing on the XL Super Tee Golf Mat, you get almost the exact same feel and response to playing on a real grass. The surface is very responsive. With many golf mats, the fibers do not slow down your clubhead properly as natural grass does, and so you tend to have a better success on your golf mat than on course. That is not the case with the XL Super Tee, as the nylon surface is built with proper density to slow your clubhead speed down during impact. As a result, you can feel the almost natural difference between hitting a well-struck shot and mis-hits. Another excellent feature of the XL Super Tee Golf Mat is the fact that you can use your regular wooden tee. This is a fairly rare feature in golf mats, and as a result, you can use various tee heights according to your clubs. Again, this contributes to the realistic feel of the golf mat. In short, with the XL Super Tee Golf Mat, you get excellent quality in virtually every aspect. Well worth the money. Key Features Ideal Practice Area: The XL Super Tee Golf Mat features an ideal size of 36” x 60” or 3’ x 5’, which is the ideal size for most training applications. This allows us to stand on the XL Super Tee Golf Mat during our practice, eliminating the issue found on many portable golf mats. Top-Quality Synthetic Surface: The XL Super Tee Golf Mat features a 100% nylon synthetic turf with superb quality. There are two main benefits of this excellent surface: first, the XL Super Tee offers an excellent response for each of your shot: you can feel it when you are hitting a fat hit, and you can also feel it when you are making mishits. In short, you get almost the same response as playing on real turfs. The second benefit is that having the right surface density will prevent injuries to your hands, elbows, or shoulders. This provides realistic and safe practice sessions. Excellent Durability: In combination with an excellent surface quality, the rubber sole is also quite thick to provide a total thickness of 1.25”. As a result, the XL Super Tee Golf Mat is very stable during use, while also providing excellent durability for long-term usage. So, you wouldn’t need to worry about the golf mat tearing after just a few hundreds of swings. Wooden Tee Compatibility: Another excellent feature from the XL Super Tee Golf Mat is the fact that you can use regular wooden tee you usually use on the real course. This allows you to use a different tee height according to the club you are currently using. This, in combination with the excellent surface quality, made the XL Super Tee Golf Mat one of the most realistic golf mats available in the market. For the Emerald Par Golf Mat, the main highlight for us is the combination between its affordability and massive size. 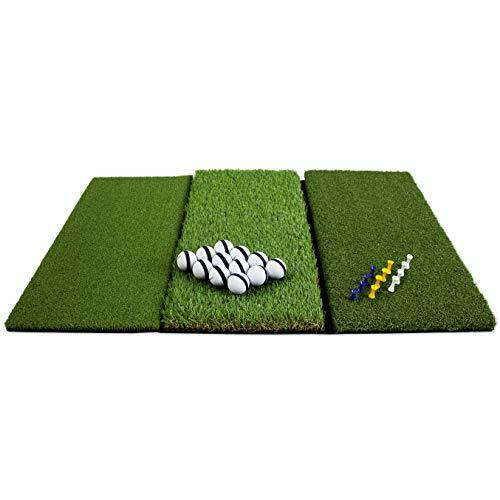 With a 4’ x 5’ dimensions, the Emerald Par Golf Mat is bigger than the Super Tee Golf Mat we have reviewed before, yet it comes with a more affordable price tag. The Emerald Par Golf Mat features a ½” thick, 100% nylon synthetic turf, which offers two key benefits. First, it is very durable, and the surface won’t easily break with regular use. The damages on a golf mat’s surface can lead to injuries and club damages, so this is a very important quality to have. The second is that the nylon surface can emulate the fairway grass almost perfectly. A common problem with practicing on a golf mat is how the synthetic turf won’t properly slow down the club head, and so you will produce fatter shots than on the real course. This phenomenon can hinder the effectiveness of your practice sessions, and thankfully it is properly addressed by the Emerald Par. With ½” of nylon fiber thickness, the Emerald Par golf mat will slow down your club head properly just before impact. 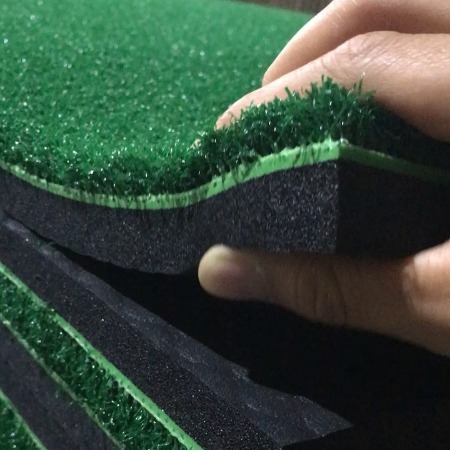 The base layer of the Emerald Par golf mat is foam rather than the usual rubber. While foam is indeed less durable, the foam base of the Emerald Par is 5” thick, and so it will provide enough stability for virtually any swings. However, if you are still concerned about the durability, you can add a thin rubber mat below the Emerald Par not only to improve durability but also will add a bit of stability to the Emerald Par. Another minor downside of the Emerald Par is the included tee. The Emerald Par includes a built-in rubber tee holder that is ½” tall. Meaning, you can’t use tees of different height when you are switching clubs. Depending on how you want to use the golf mat, this can be a major issue. Nevertheless, the Emerald Par Golf Mat offers an excellent set of features at a relatively affordable price. If you are looking for a large golf mat that is reasonably priced, the Emerald Par Golf Mat will be an excellent pick. Key Features 4’ x 5’ Surface Size: when we reviewed the XL Super Tee Golf Mat above, we have mentioned how the 3’ x 5’ size is ideal for most practice situations. Yet, what if you need more space? The answer is the Emerald Par, featuring a whole extra foot in width with a more affordable price tag. The 4’x 5’ dimensions are large enough for you to stand on and will be comfortable enough for any clubs. 100% Nylon Surface, ½” Tall: There are two main benefits of 100% nylon material. First, it is very durable, if not the most durable material commonly used for golf mats and synthetic turfs. Fiber damages can damage your clubs due to the high impact, and can also cause injuries, so this is a very important quality to have. The second is that nylon offers the most realistic emulation of the fairway turfs. With the ½” of height, the nylon synthetic turf will slow down your clubhead properly, just like on a natural grass. So, you can have a realistic practice session on the Emerald Par golf mat, almost like a natural fairway green. 5mm Foam Base Support: While rubber base is generally better than a foam base, the 5 millimeters thickness of the Emerald Par base makes up the difference. As a result, we got a very stable golf mat that moves very little during each swing, even when you are not stepping on it. A minor downside is that the foam base is not very durable. Affordability: For the massive 4’ x 5’ size we get, an included rubber tee, the 100% nylon material, and other features, the Emerald Par golf mat is relatively affordable for its qualities.Also, considering its size, it is relatively light with only 14 lbs of weight. An excellent pick for those who don’t want to break the bank for a large golf mat. 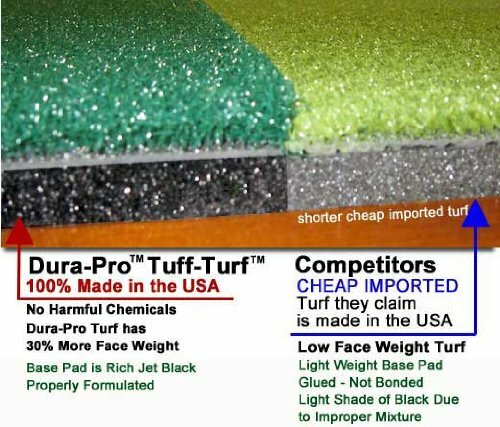 The Dura-Pro Plus Premium Golf Mat is in many ways, similar to the Super Tee Golf Mat and Emerald Par Golf Mat we have discussed above. Yet, it is significantly more expensive than both of them, begging for the question: what makes it so different? The answer to that question is quality: the Dura-Pro Plus Premium Golf Mat is simply superb in just about every aspect. First, the Dura-Pro Plus Premium features a 100% knitted nylon material, which is superior to woven nylon commonly seen in most nylon mats. Nylon is already the most durable material for golf mats (at least, currently), and can provide the best, most realistic emulation of the fairway green. By being knitted, the Dura-Pro Plus Premium Golf Mat pushes these qualities even more: the nylon surface is more resistant to tear, curl, fade, and even separation, and it offers a better, more natural shock absorption of your clubhead just before impact. Speaking about shock absorption and natural fairway emulation, the Dura-Pro Plus Premium is 1.25” thick, which aids those qualities further. As a result, you get an excellent feel and response, and practicing on the Dura-Pro Premium is arguably, as close as it gets to playing on a real grass. Another common golf mats issue tackled by the Dura-Pro Plus Premium Golf Mat is delamination. Most golf mats are manufactured by gluing the different layers together, and as a result, the glue can delaminate after a lengthy usage. With the Dura-Pro Plus Premium Golf Mat, the different layers are thermally welded together, and so won’t be delaminated. This makes the Dura-Pro Plus an excellent choice if you are looking for an outdoor golf mat. Even if you store the Dura-Pro Plus mat outside under the heat of the sun, you won’t see the glue peeling off. Although the Dura-Pro Plus Premium Golf Mat is relatively expensive compared to other options on this list, it includes a couple of bonuses in the package. First, there is a big golf ball tray that can hold a couple of dozens of golf balls. Second, you get a rubber tee holder where you can use your regular wooden tees of differing heights. This, again, tackles another issue common with other golf mats where you can’t adjust the tee height. An excellent investment, especially if you are planning to use it long-term. Key Features 100% Knitted Nylon Surface: We have mentioned how nylon is (currently) the best available material for golf mats. It is durable, preventing club damages and injuries, and it can produce an almost realistic emulation of the fairway turf. The Dura-Pro Plus Premium takes things further by using a 100% knitted nylon instead of the usual woven nylon we find on most golf mats. Knitted nylon pushes both the durability and emulation quality further, making the surface quality of the Dura-Pro Plus Premium golf mat, simply excellent. Thermal-Welding Manufacturing Process: Most golf mats are manufactured by gluing together the separate layers, and this condition can produce a major issue: the glue will delaminate after long-term usage or outdoor usage under the sunlight. The Dura-Pro Premium Golf Mat tackled this issue by thermally welding the pieces together, preventing delamination in the long run, and thus bringing you more longevity. 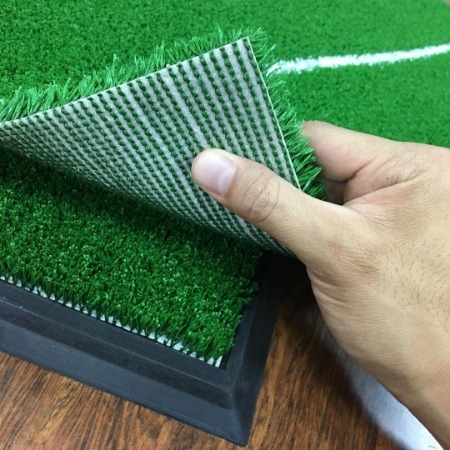 1.25” Thickness, Excellent Density: Not only the surface material of the Dura-Pro Premium Golf Mat is of an excellent quality, it also has more thickness and density compared to most golf mats out there. 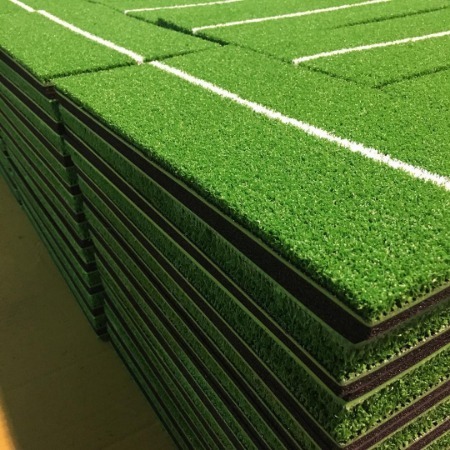 The mat is 1.25” thick in total, and as a result, not only the nylon fibers will be more durable, it will also provide the more natural, shock-absorbing characteristic of a natural grass. The fibers on the Dura-Pro Premium are highly resistant to tears, curling, separation, and fading. So, although the Dura-Pro Premium is relatively expensive, it is a great long-term investment. 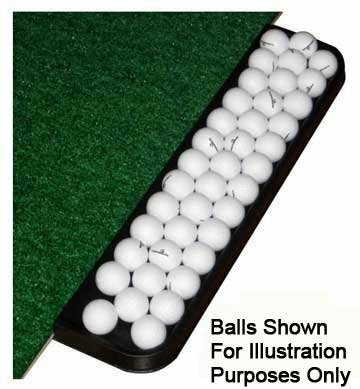 Included Golf Ball Tray and Rubber Tee Holder: you also get a big golf ball tray to aid your practice sessions. 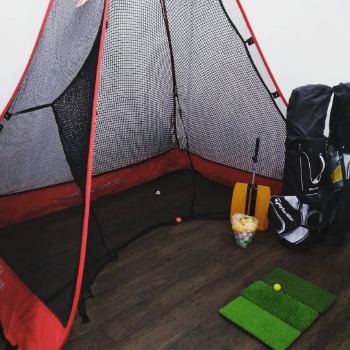 This way, the Dura-Pro Premium tackled the common issue with many golf mats: it included a rubber tee holder where you can use your regular golf tees of various heights. What are the different types of golf mats available? We can consider this type as the most basic and designed to emulate a driving range. So, it only consists of a tee and a patch of greens. The synthetic grass and rubber sole are usually relatively thick to support high-impact shots. In many ways, fairway mats are similar to driving range mats, especially since they both only feature a tee and a patch of greens. Commonly, the main difference is the synthetic grass, which usually features a thinner nylon (more on golf mats material further below). This way, the thinner surface can emulate the fairway drive with less resistance. As the name suggests, a fairway rough practice mat features one or more rough surfaces besides the fairway surface. 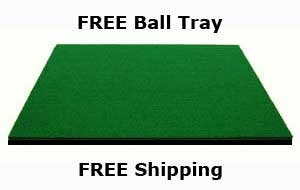 Commonly, it is bigger than your usual fairway practice mats or driving range mats to accommodate the different surfaces, and so they are usually more expensive. Similar to the above, but only features the rough surface(s). The rough surfaces are mainly made of polypropylene materials to emulate roughness. Typically, a sand trap practice mat will feature a nylon surface to emulate the heavy rough, and another surface to emulate sand traps. Thin polypropylene material is commonly used to emulate the tough lies of the sand surface. The main difference between a putting mat with the other types above is the inclusion of a hole, and sometimes more than one hole. Generally, a putting mat is also bigger than your usual driving range mat to practice your accuracy. What are the key characteristics I should look at before buying a golf mat? If you are hoping to keep your golf mat in use for several years, then you must pay attention to quality of the construction of the mat. Most mats are made from a highly durable nylon surface and rubber base so that they can handle the repeated beating of club strikes over time. 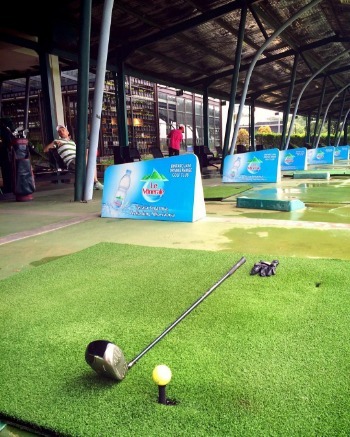 There are multiple surfaces available for different types of practices with golf mats. Most commonly, players use mats to hit drives. These driving mats have rubber guides that hold tees to secure shots. 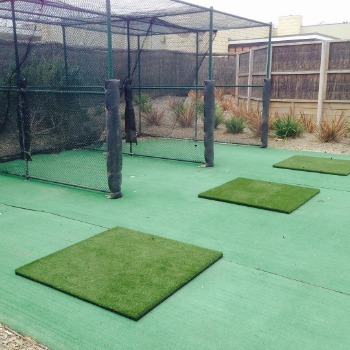 Other golf mats offer the opportunity to practice pitch shots from rough made from synthetic grass-like material. Some mats include lines on the surface of the mat to ensure that your stance is in proper alignment. When coupled with an alignment stick at your feet, you can make sure that your practice sessions are fundamentally sound. When using driving mats, it is crucial to understand your spacing at address to guarantee quality contact. Mats come in differing lengths so that you can utilize your irons and wedges during practice. Driving mats don’t have to be terribly long because you shouldn’t be coming into contact with the surface. However, golf mats that have synthetic rough and are made for iron play, do need a couple of feet of length to assure that the club won’t come into contact with the ground. The more durable the mat, the more it will weigh. With heavier materials, the golf mat could have issues with portability. Thinner mats will be easier to roll and carry in the back of a vehicle or trunk. Heavier mats will need to lay flat and need more surface area to transport. Realize that golf mats are made to lay flat, so if you do roll them up always try to return them to the flat position in storage if possible. What are the different price points for a golf mat and which one do you recommend for beginners, mid-level and advanced players? High-handicap golfers should look, not only for affordability, but also several features from their golf mat. A durable mat that can take a punishment is the first and foremost characteristic beginning golfers need to find. For golfers who are just learning the game and can’t make it to the range that often, a spacious mat handling not only drives but iron and wedge practice is a great option. 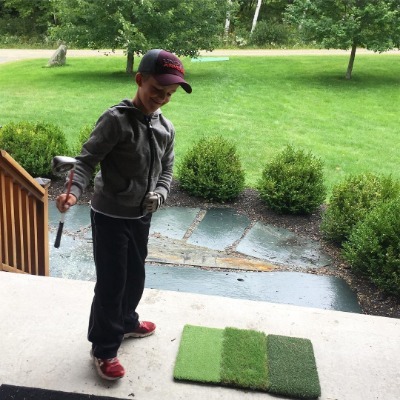 The XL Super Tee Golf Mat is a very simple yet highly usable mat for the beginner. The large size gives the high-handicapper plenty of room for any type of shot plus the superior durability of the mat makes it something that will last over the long haul. 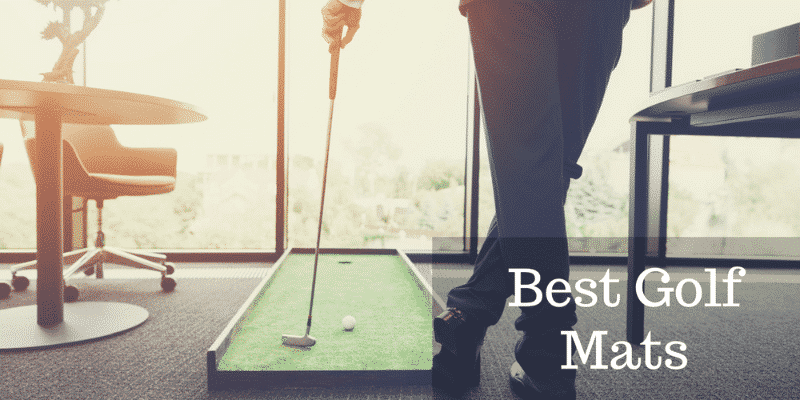 The mid-level golfer can spend a bit more money for their golf mat but need to pay extra attention in finding a mat that can help in all areas of their game. From driving to pitching the golf ball, they need a mat that can handle several points of possible improvement. For this level of golfer, it is important to find a durable mat that has some variety in the playing surface. 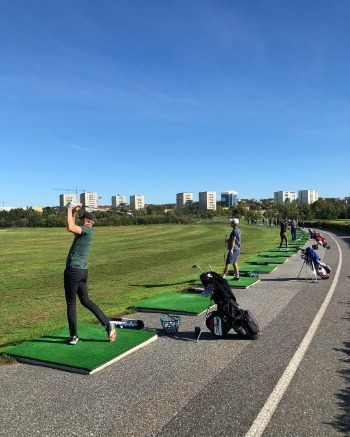 For these mid-handicappers, the Rukket Tri-Turf golf mat is perfect for the training needed because it offers three different surfaces. From fairway to fringe to rough, the Rukket Tri-Turf will have you ready for any practice session and you’ll never have to worry about transporting the mat due the light weight and flexibility of the surface. For advanced golfers in the market for a golf mat, the focus should be on an investment in a mat that has more luxurious features for practice sessions that are crisp but don’t put too much stress on the body. Thicker mats that can absorb repeated strikes and prevent the golfers from experiencing fatiguing vibration are a great place to start for the scratch golfer. The Dura-Pro Plus Premium Golf Mat is one of the best mats for the experienced golfer because it is made with 100% knitted nylon for exceptional quality. The advanced nylon accents a mat that is over one-inch thick to cushion during long practice sessions. 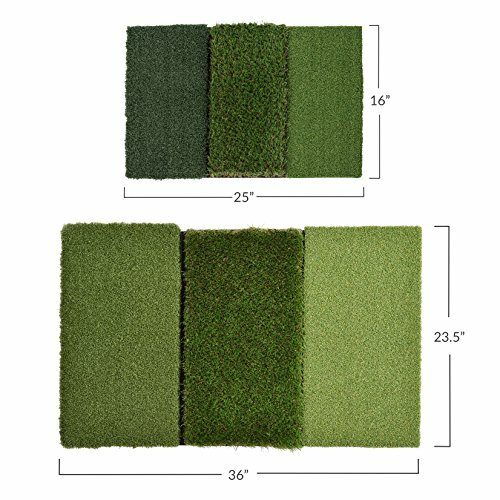 What size should I pick for my golf mat? Golf mats can vary greatly in size. Thus, choosing the proper size according to your needs is one of the biggest factors in your purchase decision. Generally, most golf mats range between 2 square feet (1’ x 2’) and 25 square feet (5’ x 5’). The bigger the golf mat is, the more playing area you will have. It is also worth noting that if the golf mat is too small, you won’t have any place to stand on, and so you might need another surface with a similar level to stand with comfort. This is the case with many portable golf mats. Obviously, the bigger the golf mat is, the more space it will take in your house. If you have a designated area to put your golf mat on and just leave it there, it might not be a major problem. Yet, if you need to store the golf mat after each use, it is worth considering that the golf mat will not only need the extra storage space but will also be heavier to move around. Most golf mats with a regular material (again, more on material types further below) will weigh around 2 lbs per sq ft. In general, a golf mat with around 3’ x 5’ in size will be proper for most applications. What material should my golf mat be made out of to not damage my clubs? Most golf mats are built with rubber (mostly black) as the base layer. Normally the base rubber layer is around half an inch thick or so, and there’s not much variation with this. It is worth noting that base rubber mats are available by themselves. You might need one for extra support, or if you are planning to get a very portable golf mat, you might need one to stand on. The main discussion here is the top layer, which is the hitting surface. Since this surface will make contact with your club when swinging, of course, we should consider the proper material to avoid damage. These 3 materials are considered safe for golf clubs and are quite durable to handle hard impact from your clubs. Out of these three materials, nylon is generally the most durable. Nylon has a higher elasticity and stronger tensile durability than polyethylene or polypropylene. For this reason, a golf mat made of 100% nylon can be considered as the most durable. How about the other two? Polyethylene is generally considered more sturdy than Polypropylene. Yet, polypropylene is more water resistant with lighter weight. Another consideration is that a nylon golf mat is generally more expensive than the other two types, but will require less overall maintenance. Of course, we should also consider the surface type, namely how fast the ball will roll on the surface. A nylon surface is generally smoother than the other two and thus feel more like a natural lawn. The ball roll on a nylon turf is far superior compared to polypropylene or polyethylene turfs, where there is a significant reduction of oscillation (ball wobbling) and deviation. To achieve the same performance from polypropylene or polyethylene greens, we can use sand reinforcements to improve oscillation and natural feel. So, in general, we can conclude that nylon is the best choice for club safety, natural feel, and durability, but will cost you more. It’s not saying that polyethylene and especially polypropylene turfs don’t have their applications. For example, polypropylene can emulate sand turfs better than nylon material. Are golf mat tees different from regular golf tees? Modern, regular golf tees are used by piercing the ground, and obviously, we can’t use the same application with the golf mat. (Well, we can, but we will destroy the rubber base layer in no time). So, for golf mats, we can use rubber golf tees that rested flat on the mat. Or, if you want to use your regular tees, you can use a tee holder where you can insert your regular tees on the cross-shaped hole. It is worth noting that some golf mats (especially the premium ones) do offer the ability to use regular tees. Avoid golf mats that offer fixed tee that can’t be adjusted. You will need different tee height with different clubs for proper practice. 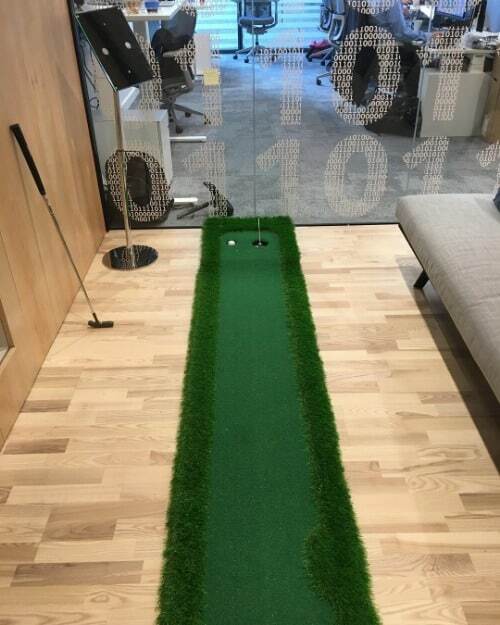 How can I make sure to practice properly with my new golf mat? First, the club will bounce and slide more into the ball on a golf mat, especially on a big swing. As a result, this can create a solid strike when you shouldn’t, masking the error and hindering your progress. If the golf mat is not maintained properly, a damaged surface can lead to elbows, hands, and shoulders injury. Have the right mindset: you can not fully trust precise and accurate distance when hitting off golf mats. Aim to achieve even more than your usual standard to avoid the illusion of satisfaction. Since the golf mat surface is generally more slippery than natural grass, wear shoes with more traction. This way, you can prevent your feet from twisting or rotating during a swing, which might affect your ‘real’ swing on the course. Some golf mats feature a built-in stationary tee that can’t be adjusted. In most cases, the tee height is too short for a driver and yet too long for fairway woods, irons, and hybrids. 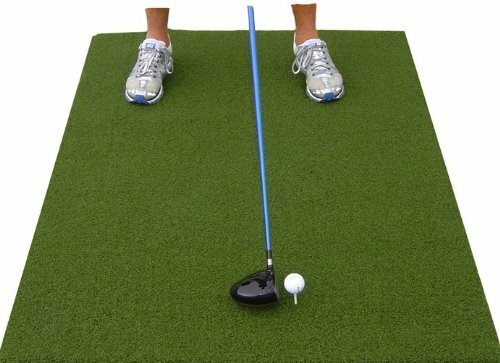 Opt for a golf mat where you can replace the tee, and use the correct height depending on your club. You might need to adjust your swing with your short irons. Generally, you will need to adjust to a sweeping swing rather than hitting sharply down with your short irons. You might want to skip the short irons entirely to avoid building bad swinging habits. Regularly maintain your golf mat, and if you feel the surface is now too firm, consider getting a replacement to avoid injuries, club damages, and bad swinging habits.